Frying Pan Rock is part of a rock outcrop on top of the Chevin overlooking Otley. 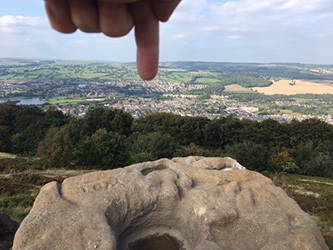 As I can see the rock from my window at home it is perhaps a little remiss of me not to have visited the top of the Chevin in the last year since the virtual was placed. I know (knew) people who had their ashed scattered from the rock when they died – and other people who intend to have it done when they pass on !